Turtles in the Maldives are endangered. The turtle is one of the emblems of the Maldives and can live for 60 years. Five of the world’s seven sea turtle species live in the waters surrounding the Maldives. Hawksbill is the one most commonly seen, the others are the Green Turtle, Olive Ridley, Loggerhead and Leatherback. Turtles are often spotted by snorkelers and divers around the Maldives. The Maldivian sea turtle conservation society established a team in 2011 following concerns over the dwindling sea turtle population throughout the Maldives. This government recognised programme is involved with three key areas of turtle conservation: the protection of turtle nests, followed by assisted rearing; the rehabilitation of injured turtles; and photo identity techniques and satellite tracking. Based at the Marine Research Centre at the Four Seasons resorts they work with local islands across the Maldives to foster awareness of turtle conservation and to help encourage them to protect the nests of turtles in the Maldives. Green turtles are found throughout the archipelago. The green turtle is large, with a carapace up to 3 feet long. They can weigh up to 350 pounds and their carapace can be many colours, including shades of black, grey, green, brown or yellow. 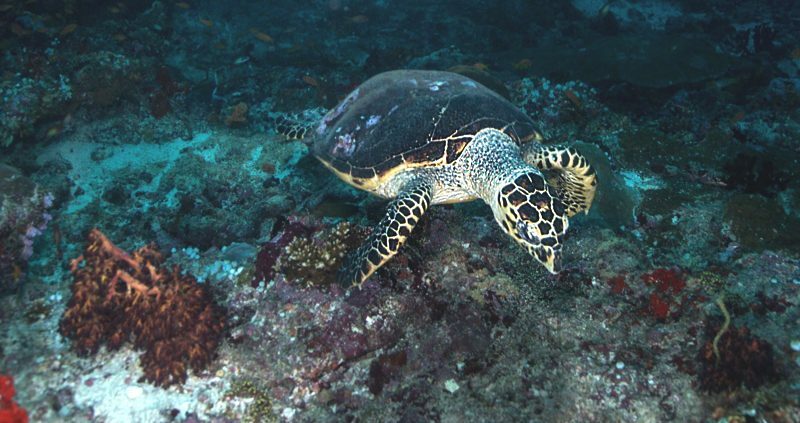 Adult green turtles are the only herbivorous sea turtles. When young, they are carnivorous, but as adults they eat seaweeds and seagrass. Hawksbill turtles forage and nest throughout the Maldives. The grow to approximately 3.5 feet long and weigh up to 180 pounds. Hawksbill turtles were named for the shape of their beak, which looks similar to the beak of a raptor. The eat sponges. These turtles have a beautiful tortoiseshell pattern on their carapace, and have been hunted nearly to extinction for their shells. Olive Ridleys are not known to nest, they are commonest offshore and in the north. Named for their olive coloured shell. They are small and weigh under 100 pounds. They eat mainly invertebrates such as crabs, shrimp, rock lobsters, jellyfish, and tunicates, although some will eat primarily algae. Loggerhead turtles are very rare in the Maldives, with very few sightings. They are a red-brown colour and have a very large head. They are the most common turtle that nests in Florida. Loggerhead turtles can be up to 3.5 feet long and weigh up to 400 pounds. They feed on crabs, mollusks and jellyfish. Leatherback turtles are also very rare in the Maldives. They are the largest of the sea turtles and can reach lengths of over 6 feet and can weigh over 2,000 pounds. These animals are deep divers, and have the ability to dive to over 3,000 feet. The Leatherback turtle has a shell that consists of a single piece with 5 ridges, and is distinctive from other turtles who have plated shells. As a means of managing the control of turtles in the Maldives it is illegal to catch or kill a turtle, import turtles or turtle products and sell turtle or turtle products into the country. Also there are 14 priority nesting beaches that are protected by law. Unfortunately the ban on catching turtles does not include the collection of turtle eggs from nesting beaches. The collection of eggs still continues and conservation groups are trying to convince the government to protect the eggs as well as the turtles in the Maldives. Contact us to book your holiday and your chance to see turtles in the Maldives.